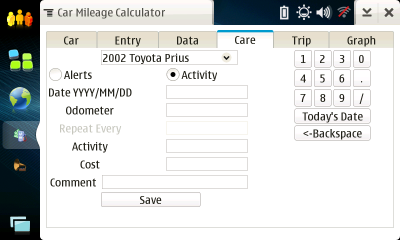 This is a project to develop software for a Car Mileage Calculator. It is designed to run on the Nokia N800 and like Internet Tablets. This is my first program I have written for the Nokia Internet Tablets. This software is GPL. 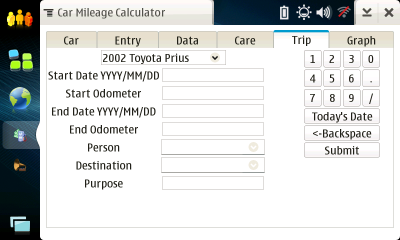 This program will allow you to enter data for multiple cars. It currently consists of five sections. 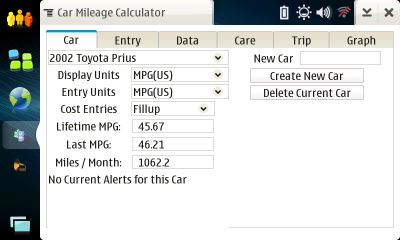 A Gas Mileage section, an Activity section, an Alert section, a Trip section and a Graph section. 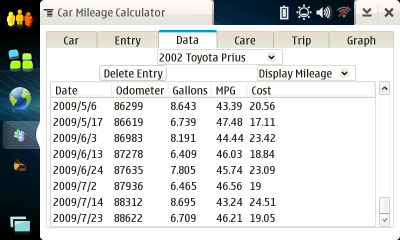 For the Gas Mileage section you enter the date, odometer, cost, and fuel used each time you fillup. 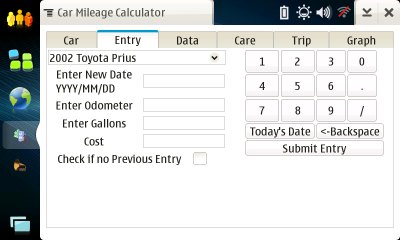 It will then compute the mileage after each fillup as well as display your lifetime mileage, last mileage, and distance driven per month. For the Activity section you can enter past activities done on your car. These can be items such as past maintance activities. For the Alerts section one can enter future events due for your car such as oil changes. On the car tab when an alert is due within 1000 miles or kilometers it will be displayed on the car tab. For the Trip section you can enter the data on a trip. 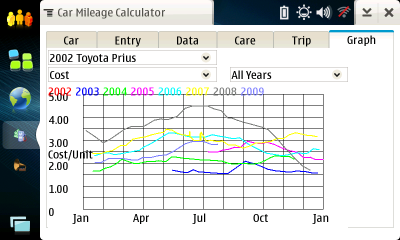 For the Graph section you can plot your mileage, cost, and the distance traveled.